A Smile for the New Year? Hope you are having great holidays! After all, Santa did visit me and I got a long-requested home-constructed hand rail built up the back stairs into my garden, in order to increase safety at our home. Now I can garden away in the spring. I’m truly grateful to my talented partner, and excited each day to go outside and up the stairs in safety, to appreciate the progress in our back yard! Plus, it’s great exercise! I also implemented walking as a major part of my strategy to keep waist-trim and my weight under control (way back in 2003 and more recently 1.5 yrs ago, more devotedly six days a week; I am now walking, and swimming three times a week, to help me get over a back spasm). It works for both, and is a nice adjunct to any corset waist-training program or “diet” for the New Year! On my daily walks, however, I have noticed that people I pass smile less and less frequently. Smiling actually has some benefits to exercise, albeit to more vigorous exercise. Still, I believe it would benefit anyone who walks, even if there in no scientific evidence of such, to reach out verbally and to smile at those one passes. It takes some courage to interrupt–well, you know, texting walkers who seem to live in their own little egotistical world, oblivious to the beauty of nature and the outdoors or to anyone coming along their path. Today is a glorious San Francisco summer-like day. Really — it’s like summer weather here in the low 60s (while much of the country suffers from huge piles of snow and freezing weather). I had to change to a summer t-shirt for my walk, removing my silk long underwear, fleece top, and down vest! I was sweating by the time I got back from the 1.5 mile walk, but truly loved the trip! However, if anyone smiles along the way, it seems to be me. If anyone says “hello” or “how are you?,” it’s usually me. Half the folks I pass are walking while texting–one of my main complaints these days. Half of half of those almost plow into me as they pass, more or less oblivious to my coming and my going. I guess they think they own the sidewalk. The worst of the worst are mothers (always in our neighborhood it’s the moms or nannies, even) who are pushing a baby in a stroller, while they text away–even when they cross intersections. True, intersections are sort of peaceful along the route to the park and back that I take, but cars come nonetheless. I always wonder how those moms would feel if a car careered around a corner and decimated the carriage and its precious contents while the mom texted? Apparently, the possibility of risk and death escapes these moms. Unbelievable. I recently read that smiling while running actually improves efficiency 2.78 percent as a group in a research study published in September’s Physiology of Sport and Exercise (see “Grinner’s Circle” by Gretchen Reynolds in the NYTimes magazine, 12 10 17). But they can’t be false smiles. Grinning sincerely and often near a race’s end works better, rather than continuously during it. This is the first scientific evidence to support the idea that smiling can help us exercise! I’m not advocating taking a 20 minute walk while grinning from ear to ear the whole time. But I am advocating reaching out to others by initiating a quick smile and a “hello” loud enough to interrupt texting, and to cause eye-to-eye contact, rather than downcast eyes as folks try to avoid contact. To me it’s a very sad recent change in my neighborhood. We call our neighborhood in San Francisco a “village” (it has that flavor), but it’s changed over the 40 yrs. I have lived here. It no longer has a village feel, mainly because hardly anyone is friendly any more. I think I’ll add “to smile and say hello” to every single walker I pass (sometimes they don’t even know what to say, they are so surprised!!) during my daily walks in 2018. It seems worthy goal and worthy New Year’s Resolution, plus a simple, do-able goal as well. I can’t change the world, but I can do my part to live an example that used to be true in our village. Maybe you can join me in your area of the country? What? Two blog posts in one day? I’m inspired by today’s Alexander Technique class to post this blog just after posting one this morning that muses about why we are often hesitant to try new things like corset waist training. About four months ago I sure jumped into the “new thing” of weekly Alexander Technique classes. Raven, my web assistant, happened to send me the name of this alternate therapy because she knew at the time that I suffered fairly strong low back and neck pain. My classes are taught one-on-one by my neighborhood AT teacher, Elyse Shafarman of the Body Project in San Francisco. Elyse teaches me in her home studio, but also regularly teaches acting students at the American Conservatory Theater downtown San Francisco. For me, Elyse was the right person at the right time in my life. Sometimes it happens that way. Elyse has made or helped me to make substantial changes in my health over the past months — but also she has made changes in my psyche and in my life. This includes how I relate not only to my physical self and bodily feelings on a given day, but also how I relate to others in my life, as well as to some possibly new beginnings I’m thinking about implementing in the coming New Year of 2018. I’ll bet you have even given some thought to New Year’s Resolutions or goals (as I like to call them), haven’t you? Or you soon will! Perhaps one of them might be to try an initial Alexander Technique lesson to see what’s it all about and if it might hold some benefits for you? To start, if you feel stress in your daily or weekly life, and are ready to minimize it because you are committed to your improved health and well being, then the best way to start to see if AT might work for you, is viewing the youtube video of actor William Hurt taking a lesson from a well-known AT teacher. Some, like me, may be coming off of a physical injury that might include damaged muscles in your back (from a low back spasm, gratefully with no disc involvement) and neck (from chiropractic manipulation). Some may suffer pain from scoliosis or perhaps, fibromialgia. Some may just be old-fashioned stressed out! 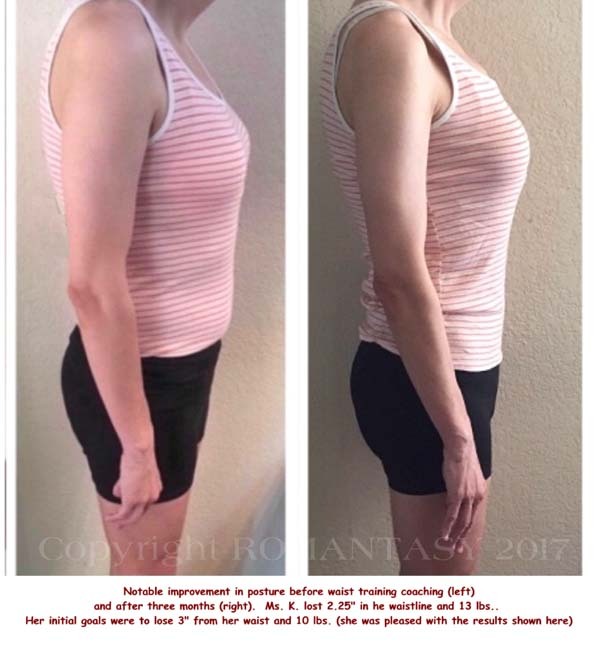 Many folks have found relief by wearing corsets to brace weak or injured backs, and even by corset waist training before resorting to surgery or even to pills. Those real life cases are well set forth in Lucy William’s great book, Solaced (available on Amazon.com). I highly recommend that you survey the extremely wide and beneficial reasons that some of us corset enthusiasts wear the garment. Of course, there are also more nuanced psychological benefits from wearing corsets, or from adhering to the discipline of health-conscious, moderate waist training. The structure of the corset itself, coupled with the structure in waist training, of a regular, anticipated schedule of daily (six days a week is recommended) corset wear, certain new eating habits and foods, and certain waist-targeted exercises, can be quite comforting in an otherwise chaotic, hard-driving lifestyle or world. Likewise over the past three months I have found nuanced psychological benefits from pursuing my weekly Alexander Technique classes, benefits I did not expect at first. I can now see how taking AT classes while doing waist training, could really boost one’s progress forward toward better overall health. I first went to have Elyse try to resolve some of the low back pain from the back spasm and worse upper neck pain that occurred last November. I’ve blogged a few times about the relief I have experienced from the classes and thereafter as I implemented both the physical postural changes I learned, as well as proper self-messaging regarding pain and posture. That continues; on most occasions I can immediately identify when I begin to hunch my shoulders, and let go, know when I am holding my breath, and let go, identify more readily when I have locked my knees and legs, and relax. I can immediately take the proper and effective counter move to correct problems that have led to too many muscles being utilized in daily activities, or the wrong ones being engaged. I have also learned how to breathe more effectively and fully. Sounds funny, right? Has my corseting limited that in the past? Perhaps or perhaps not. Corseting of course, means that you learn to breathe higher in your chest and not in the lower belly. What I’ve learned most of all about breathing in AT, is how to fill up and move outward my back ribs and move the breath upward under my armpits — areas not encompassed or restricted by an underbust waist-training corset that I tend to wear (I almost never wear overbust styles). Not long ago I had to undergo a complex diagnostic procedure (with excellent results by the way! ), not at all pleasant and certainly scary because of certain risks. While I was waiting for my doctor and anestheologist and lying on the gurney under warm blankets. I practiced the deep breathing techniques that Elyse has taught me, and I was able to relax and almost endure the wait, then not be totally freaked out when they came to roll me into the procedure room. I’m not sure I could have gone thru all that, without this breathing exercise to sustain me! As I have continued swimming three times a week and walking 1.5 miles five days a week over the past year, plus sometimes wearing my cincher and a soft collar, the addition of the Alexander Technique classes has led to me being overall more relaxed in my life. My pain level has gone from about a 6-7 daily, to a 1-3, with no pain at all on some days and only minimal discomfort toward the end of the day. I can now stand an entire day without having to lie down, tho’ I often love to take a 30 min. to one-hour lie-down in the late afternoons to rejuvenate myself for the evening. I now seem to be better able to focus on the task at hand, I am more content with how my days go by, I have even made a few good new friends, am reaching out more to neighbors, and I have faced a few tough personal relationship issues with more equanimity and better results than ever before in my past. Sure, when we are in our 20s, 30s, 40s and 50s, many of us are hard-driving in our quest for a decent, acquisitive lifestyle and perhaps, our own career advancement and family well being. That makes sense; we need to push forward! Then in our 60s and 70s and beyond, we reach a slow-down stage and learn to work smarter, not harder, or we enter retirement, or we face a disabling health challenge that puts us down for the count. It is then that we come to think hard about how we are spending our time, what action results in real improvement, what truly gives us pleasure, and how much effort we want to put forth to achieve the results of goals we have set. What has happened to me is somewhat mysterious. Elyse’s gentle guidance and gentle laying on of hands while I stand, or lie on her massage table, has minimized my pain to the point on most days of muscles feeling like I “overdid” exercise but with no sharp or nagging pain. Her classes and teachings have given me a more patient approach to my life. I’ve learned and am still learning how to be patient with myself and my slow progress toward being as fully functional and as pain-free as I can be, with no particular time table. I’ve learned not to be so driven as I have been in my former life when I opened a retail shop for eight years, transferred to the web, went around the country to national exhibits to sell corsets or lecture on waist training for six or seven years, wrote two books, and worried greatly about the future of my business and business model. As one consequence, I’ve weaned off of heavy pain-control pills, to take none on a daily basis over the past three months. In the 27 years I’ve owned ROMANTASY, I’ve met or corresponded with maybe 20,000 people or more, those interested some, or a lot, in corsets. I have often been surprised and concerned when we get to more personal conversations, to learn how many people are taking anti-depressants, Or anti-anxiety meds. Why is that? Are doctors pill-pushing quick fixes on us? Is it just more convenient and easy to pop a pill than to work on a relationship or go ask the boss for a raise? Is some transition we are working on–be it divorce, changing from male to female, being fired and having to look for a new job, or rehabbing from a bad accident–sufficient reason to take pills to calm down and be able to face our days, and our choices? Since the Alexander Technique has minimized my pain substantially, and has minimized the stress I feel in my life overall, I see it as a possibly beneficial alternative to pills or doctors for most folks, even if they don’t have physical pain. Sadly enough, my Kaiser plan does not offer it and my primary care doctor knew nothing about it–so I bear the cost (it’s not cheap but it’s also not expensive!). I recently called this program to the attention of the No. Calif Kaiser Medical Director and staff. Here is my point: if you are suffering from the stress of a tight budget, a demanding job or family, an upcoming physical relocation or house purchase, a nasty boss or coworker, overwork and tight deadlines, or any other stress-causer — AT classes might be just the right investment of your time and money, at least for a few weeks, if not for a few months, or even occasionally over the coming years in a kind of “tune up” when needed. Yes, you can learn quickly in a few lessons what to do and think. But really feeling the hands-on of the teacher showing you gently how to relax and let go, giving her the chance to really observe you more than once to come to some conclusions about how you might re-balance your body, learning the most beneficial self-messaging, getting feedback and original ideas that fit your unique body and psyche, and having the chance to engage your mind and discuss with your qualified teacher the theory of AT and how and why things work the way they do in our bodies and minds — those things have been of enormous benefit and use to me in all aspects of my life, personal and professional. As we all think about possible New Year’s resolutions for 2018, I hope better health and continued good health are your top priorities!